Seals and emblems used will be official state seals or VERY similar seals used by the school. 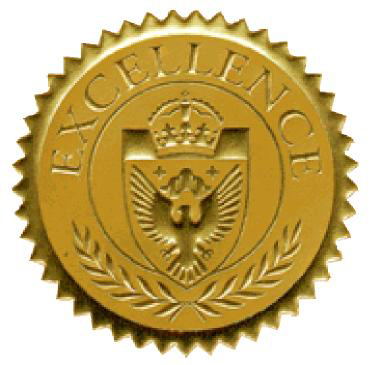 We can't replicate the high school or college seals 100% but we come VERY close. We offer real Raised Gold Foil seals and Embossed seals that can be upgraded when you place your order. If you do not wish to have a Raised or embossed emblem just leave the space blank and we will apply the appropriate flat ink seal to your order. All seals are based on the real thing! Check out the seals in the samples below. These are the capabilities that we have and what your document will resemble when you get it. Before ordering a fake diploma and transcript, it is essential to check out the different samples of fake certificates. Most fake diploma companies have a wide collection of sample fake diplomas and transcripts on their websites, but some of them do not display entire certificates because they may violate copyright rules if they do so. Our samples are all shown with Realistic Diploma across the front of them, this is for duplicating purposes only on our website, your fake diploma, fake certificate and fake transcript etc. will not arrive with the words Realistic Diploma on them. Judging from the logo and other parts of the sample duplicates, it is possible to get a general idea of the quality of their work. Compare the colors and tones of the print, logo, or seal of a duplicated diploma or transcript with those on the original, and try to look for any visible difference between the two certificates. A well-made fake certificate will be visually identical to the original, even to the minutest details. There are many websites that offer fake diploma, fake university degree, and fake college degree duplication services, but ours are the best and you can find out which ones are most reliable by checking out our testimonials. Many people are trying to get fake diplomas and transcripts nowadays, either because they wish to own duplicates of their originals or they want to play a prank on their friends. With the advancement of printing and computer technology, diplomas and transcripts can be reproduced with great precision. A fake high school diploma and transcript can be so well-duplicated that it is quite impossible for ordinary people to distinguish them from the originals. We are a premier diplomacompany; we take pride in our fake degrees, fake diplomas and fake transcripts. A diplomacompany should pay attention to the details because that is what will set our diploma aside from the rest we offer such things as: high quality seals, emblems and school logos. We also include raised gold emblems for authenticity. View our samples so you can get a better idea of what we offer and see why we are such a successful diplomacompany. Our top-of-the-line, GOLD FOIL STICKERS, have a matte and shiny gold foil appearance and are also embossed (raised) which means you can feel the design with your finger. They are available on any of our diploma styles for FREE. While they don't include a particular school name, they will present a very realistic look on your novelty diploma.